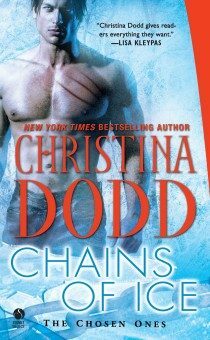 CHAINS OF ICE, book three of the Chosen Ones, takes up where STORM OF SHADOWS left off. The Chosen Ones desperately need a leader, and John Powell has been suggested as a candidate, but hints of his tormented past make him a risk and finding him in the wild Russian mountains is almost impossible. At the same time, innocent Genny Valente is given a chance to follow her dream and work as a wildlife observer. “Hey, how come the men have to change the tire?” Calvin groused loudly. During the four hour drive up into the mountains, Genny had come to realize he did everything loudly, and every sound exacerbated the pounding of her headache. “It’s not like you’re doing anything.” Avni cast Calvin a dark look as she helped Misha place the aged and feeble jack under the fender. Great. Lubochka had eyes in the back of her head. Genny gave an embarrassed smile and fled up the narrow, winding mountain road. “She’ll get lost, wait and see,” she heard Calvin say. “Don’t go too far!” Lubochka shouted. Genny waved a hand and walked around the curve. They formed the foremost team of wildlife observers in the Russian Ural Mountains. They met in the summer and drove to the small village of Rasputye where they took photos and videos of the Ural lynx. They were three-quarters of the way now, twilight turned the light a grayish-blue, and it would be dark when they got there. But as far as Genny was concerned, the flat tire had been a Godsend. She had, disgracefully, been the one who got carsick on the trip. She hadn't actually tossed her cookies, but the dust of the road and the smell of the exhaust combined with the bumpy ride had nauseated her, and everyone in the van knew. Calvin had mocked her, of course. The men had offered encouragement. Lubochka had tersely told her not to vomit on the equipment. Now Genny made her way to a fallen log a few feet into the woods, sank down and wrapped her arms around her knees. Around her, tall trees lifted their branches to the sky. The woods were tall, deep and dark, and somehow Genny thought it smelled old … so old. Something drifted down to the forest floor, and Genny half expected to see that it was one of Hansel and Gretel’s bread crumbs. But it was a pine needle … no, two … no, three … shaken from the trees by the barest wisp of wind. Then the breeze died, and the silence was profound; the soil and trees swallowed every sound. And someone was watching her. The hair at the base of her skull lifted. She froze. Warily she looked around. She did a double take. Eyes. Pale blue eyes staring at her from the underbrush. She rose, her gaze fixed on those eyes, a man’s eyes … was this the man she had come to Russia to find? Was this the lost Chosen One? “John?” she whispered. And she did, the face that went with those eyes … faded into the twilight. She was alone again, and all she could hear was her pounding heart. Around the bend, the Volkswagen roared to life. Genny backed up, her gaze flicking from tree to tree, trying to see where the man … it had been a man, she was sure … had gone. She reached the road as the van drove up. Behind her, someone opened the door. “Get in, Genny! We’re late already.” It was Avni. And a forty-pound female cat with red fur and distinctive black markings strolled out of the brush, posed for a moment, its eyes fixed on Genny, then turned its back on the astonished group and slid back into the forest. John Powell rose from his blind in the underbrush, stepped out on the road, and watched the Volkswagen van chug away, spewing blue smoke out its rusted tailpipe. The girl had seen through his camouflage, and that surprised him. He had been in Special Forces. He was so adept at camouflage wild animals, all unseeing, had bounded over the top of him. But then, the girl herself surprised him. Every year he came out to look over Lubochka's new team. He didn’t fool himself about his motivations. He came to make sure none of the Chosen Ones sneaked in to spy on him. He wasn’t paranoid; he was realistic. He had signed a seven-year contract to work on a team of Chosen. He had left before his term was completed. There was nowhere on this earth he could run where they couldn’t find him. So sooner or later, they would come and demand his services. Because the Gypsy Travel Agency might serve a higher cause, but its board of directors were ruthless. Without modesty, John knew he was one of most powerful Chosen in recent memory. Yes, sooner or later they would do what they could to force him to return. But first they would artfully scope out the territory. He figured Lubochka's team was the Agency’s best chance for sneaking up on him, so with a handful of metal debris on the road and the bald tires on Lubochka's van, he guaranteed they would break down. For the third summer in a row, it worked. In past summers, all unknowing, they had talked to each other and he had listened. So far, no one by word or deed had ever made him suspicious. So far, he’d been lucky and the Gypsy Travel Agency had left him alone. Seeing Genesis Valente had been a shock for which he’d been totally unprepared. For the first time since he’d started observing Lubochka's female Americans, he’d been attracted. No, worse. He’d been enthralled—and he didn’t know why. She was pretty. Not beautiful, but with the kind of face that caught and held his attention. A head full of dark, curly hair pulled back into a careless pony tail. A beautiful olive complexion, a cleft in her chin, and the most exotic golden-brown eyes he’d ever seen in his life. They glowed in her face like coals burning with the kind of rosy hope and enthusiasm he only dimly remembered. She couldn’t be for real. She just couldn’t be. Because simply seeing her made him feel. Those events two years ago had cured him of emotions. He was hollow, empty inside, and if he started feeling sorrow or amusement or loneliness or joy, it would mean life was returning to his soul, like blood to a limb that had been frozen. He didn’t want it. He didn’t want it. His power had been contained for so long. Better that it stay contained forever. He couldn’t trust it. He couldn’t trust himself. Like a bear fleeing a swarm of mosquitoes, he shook his head and fled into the woods. But he couldn’t escape his thoughts. What was he going to do if Genny's golden eyes mirrored her soul, if she was truly a dreamer, bright and idealistic? He didn’t know that, either. Yet if she was real, if the warmth in her eyes thawed the ice in his veins … then he would have to leave her alone. Because he would destroy her … as he’d destroyed all the rest.